Information about which plants are endemic or near-endemic has been added to the website's database. A taxon which has so far only been recorded from within the borders of Zimbabwe and is considered confined to the country. A taxon that has its largest population confined to Zimbabwe, or is found in a relatively confined transfrontier area such as the Chimanimani Mountains, an area of c.200 km2 on the Zimbabwe-Mozambique border. The paper, Endemic Plant Species of Zimbabwe lists 232 species which are endemic or near-endemic. An additional source of records of endemics and near-endemics is an unpublished list compiled by Jonathan Timberlake, dated December 2004. A list of endemic and near-endemic species in Zimbabwe which are marked as such on this site, may be found by following this link. Not all the species have yet been added to the database and the list is therefore incomplete. The area with the greatest number of endemics is the Chimanimani mountains with no fewer than 70 endemic or near-endemic taxa. A second important area is the Great Dyke. 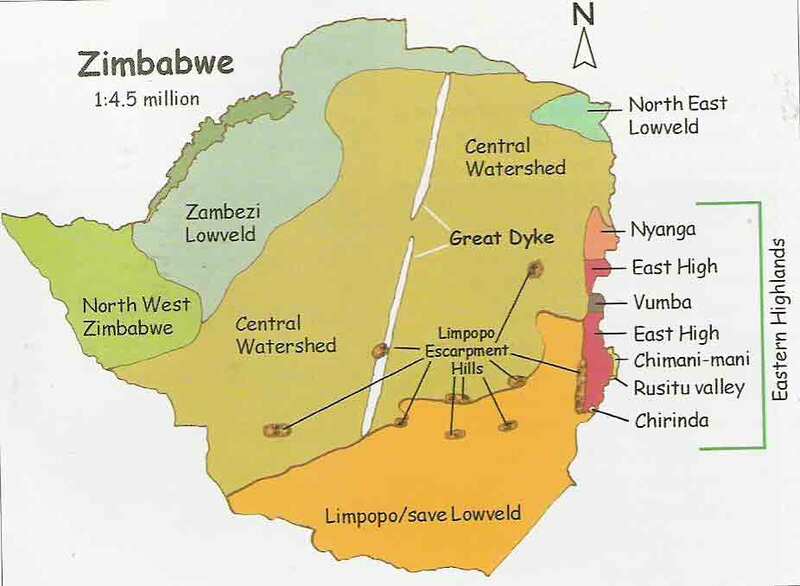 In addition, there are many endemics in the more broadly defined Eastern Highlands, the central watershed, NW Zimbabwe and the Limpopo escarpment. Full details are given in Mapaura (2002). The following map shows the location of many of the places referred to. Hyde, M.A., Wursten, B.T., Ballings, P. & Coates Palgrave, M. (2019). Flora of Zimbabwe: Endemic plants.